From initially lagging well behind early high-penetration categories such as consumer electronics, books, and apparel, furniture is now emerging as a key growth category. Online furniture purchases are growing at a rapid clip, estimated to currently be around 14 percent rate annually and is anticipated to reach 7.6 percent of total category sales in 2018. Savvy furniture brands are becoming increasingly aware of this shift in consumer shopping patterns and are taking steps to embrace the importance of creating a seamless online customer experience consistent across all eCommerce websites. Selling furniture online remains logistically complex. It requires the disciplined coordination across an ecosystem teeming with bricks and mortar stores, salespeople, warehouses merchants, and a network of delivery systems. All this complexity poses challenges for brands looking to deliver a consistent brand experience for consumers across multiple eCommerce websites. One frequent outcome of this complex ecosystem is the emergence of white labeling. A white label product is one that is manufactured by one company only to be bundled and sold by other online merchants using different brand names. The end product is positioned as having been manufactured by the brand marketer. These white label products are frequently sold at a significant discount, compared to more mainstream name brands in the category. Electronics brands have often been victims of this phenomenon. Typical electronic white label products now commonplace range from radios and DVD players to computer mice and keyboards, through to TV remote controls. Increasingly, the furniture vertical is no longer a stranger to white label packaging and marketing as well. At DataWeave, using our proprietary data aggregation and analysis platform, we analyzed a range of factors of the furniture vertical, specifically the emerging phenomenon of white labeling. 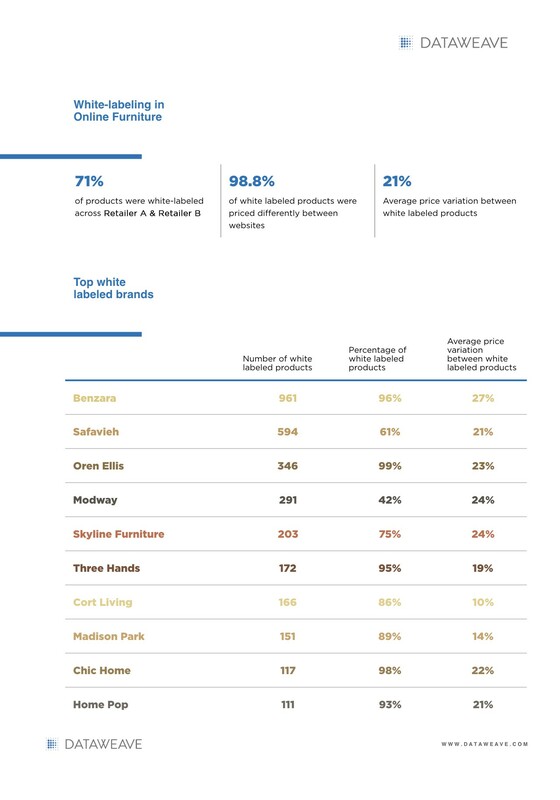 Our analysis spanned a sample set of over 20,000 products that we tracked across the websites of two of our eCommerce customers (whom we don’t wish to name) that have a large assortment of furniture products. Let’s call these eCommerce companies Retailer A and Retailer B. We identified white labeled products as being those that featured the exact same image between the two retailers but were sold under different brand names. Here, our AI-powered advanced image analytics platform matched the images of various products at an accuracy of more than 95%. The following infographic summarizes our analysis. Clearly, not only is white labeling quite prevalent here, but in almost every instance, we identified price variation. Some of the white labeled products were sold by lesser-known brands with significantly lower price points. This pricing strategy could potentially damage the customer experience for well-established consumer brand franchises in several ways. The shopper sees through the branding exercise where the same product is repackaged and presented as having been “produced” by a different brand, potentially eroding brand loyalty. As some 71 percent of the products studied were identified as white labeled products, this exposes the category as a whole to this risk. The shopper may be confused by the price difference as well, undermining the brand’s carefully constructed pricing perception. The average spread of 21 percent between competing white labeled products is potentially a major source of consumer dissonance and confusion. While the inconsistent experience potentially created by widespread white labeling is almost characteristic of the furniture vertical, other eCommerce areas such as pricing and promotion have also been demonstrated as being key influencers of the shopping experience. Today, brands have little control over how their products are priced on eCommerce websites and are susceptible to pricing decisions taken by either the merchant selling the product or retailers themselves. Here, price change decisions have little to do with providing a consistent brand experience, as it’s not really a priority for merchants and retailers. In a hyper-competitive retail environment, retailers often discount heavily or change prices frequently to drive sales and margins. The following infographic summarizes the differences in pricing approaches between the two retailers we analyzed. Both retailers demonstrated quite divergent approaches in their pricing strategies. The key point of difference appeared to be Retailer B’s discount execution, which proved more aggressive than Retailer A’s, routinely exceeding the latter by five percent or more. This discounting strategy is focused on the 40+ percentile (by price, with 100 percentile being the most expensive product), and above price bands, while both retailers displaying similar strategies to their Top 20 and Top 20 to 40 percentile ranges. 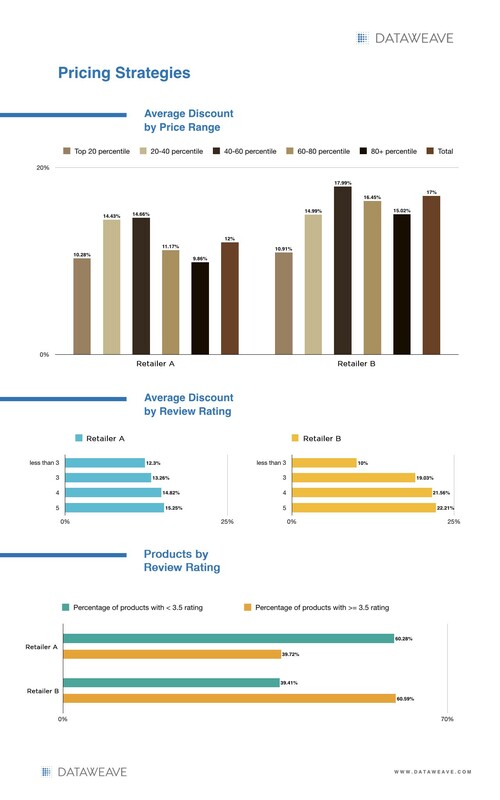 We also observe how Retailer B is more inclined to offer higher discounts on products with higher review ratings, compared to Retailer B’s strategy — a play on developing a “low price” perception among shopper. Today, consumers expect a truly seamless shopping experience right across a brand’s entire integrated retail community, regardless of whether it is physical or digital. Consumers have evolved beyond being merely time poor and have emerged as a group of impatient shoppers, unforgiving of inconsistencies in their experience. With retail evolving to embrace multiple consumer touch points with a brand, the practice of white labelling represents a dangerous source of potential confusion and disillusionment. This raises the degree of difficulty involved in converting website visitors into buyers. Further, inconsistent pricing between eCommerce websites, due to dissimilar pricing strategies adopted by each website, only compounds the problem for furniture brands. Technologies like DataWeave’s Competitive Intelligence as a Service, that can provide furniture brands with timely insights on white labelled products, unauthorized merchants, and price disparity between ecommerce websites, can assist furniture brands in their efforts to better manage their online channel. Visit our website to find out more on how we help consumer brands protect their brand equity and optimize the experience delivered to their customers on eCommerce websites!